The top seeds could not have asked for better weather or better results Saturday in the second round of the USTA Boys 18s Nationals, with the top 22 seeds advancing. With temperatures in the low 80s, comfortable humidity and no threat of rain, conditions were ideal, and the top four seeds took advantage, moving into Monday's third round. Top seed Michael Mmoh defeated Ivan Thamma 6-4, 6-4 on Court 1, the George Acker court, while on the adjacent Court 3, second seed John McNally downed Jacob Walker 6-1, 7-5. On Stowe Stadium's third show court, Court 2, No. 3 seed JJ Wolf beat Beau Pelletier 6-1, 6-3, giving the tournament spectators their first look at a trio they no doubt remember from the past two years. McNally won the 2014 16s championships, Mmoh has reached the 18s quarterfinals the past two years and Wolf was the top seed in the 16s last year, finishing third and winning the Bobby Kaplan sportsmanship award. No. 4 seed Sam Riffice, another familiar face from 2015 after finishing in sixth place and winning the Wes Richards Feed-In sportsmanship trophy, also had an uneventful opening match, beating Scotty Cameron 6-4, 6-1. No. 10 seed Oliver Crawford, who defeated Nicholas Beaty 6-3, 6-3, has been watching this week's run by 18-year-old Reilly Opelka at the Atlanta ATP tournament with special interest, after beating Opelka in the final round of the Plantation Futures qualifying less than six months ago. (Opelka lost to top seed John Isner in tonight's semifinal 6-7(5), 6-4, 6-2). "It definitely feels pretty cool to say I have some indirect wins over some top guys," said the 17-year-old from Spartanburg, South Carolina. "But obviously, he's playing better than he was in the beginning of the year, and I knew that was going to be the case. He'd had a few injuries in the beginning of the year, and I definitely caught him on one of his worse days and on one of my better days. It was a good win, but I didn't play the Reilly that is playing right now. I'm very pleased for him." Crawford, a 16 semifinalist in 2014 and a doubles semifinalist in the 18s who lost to Tommy Paul in the round of 16 in singles last year, is happy to be back in Kalamazoo. "This is awesome, I enjoy this tournament every year," Crawford said. "This is a fun tournament to be at. The atmosphere is one of the best around and I've had some good results here." Crawford played on European clay and grass the past two months, his first experience with either surface. "It was definitely a tough summer," said Crawford, who stayed with family in Great Britain. "I would have liked to have done better than I did, but it was a good learning experience and I look forward to being back there next year. Those tournaments were some of the toughest ITF tournaments." "Grass was tougher to get used to," said Crawford, who traveled to South American with the USTA in March after playing the Futures Circuit in Florida this winter. "We'd played on clay and the only hard court tournaments we played all year were Carson and Easter Bowl. So we really didn't get used to any fast surface. When I was in England, I tried, but it was tough to get on the grass, so I played on AstroTurf. It was not the ideal conditions. I had a lot of fun playing on it; obviously I didn't do as well as I had hoped to, but I look forward to next year." The highest seed to lose on Saturday was No. 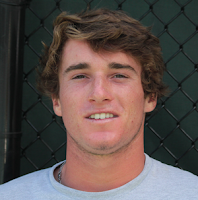 23 Matthew Lord, who fell to Aleksandar Kovacevic 6-7(3), 6-0, 6-2 at Western Michigan University. Other seeds in the 17-32 range to lose were No. 24 Ryan Seggerman, who lost to John Carlin 2-6, 6-3, 6-1 and No. 25 seed Jason Lui, who was beaten by Robert Krill 6-3, 4-6, 6-1. Kristopher Ortega defeated No. 28 seed Maxwell Freeman 6-4, 6-1, Galen Lee took out No. 32 seed Casey Ross 6-2, 6-3 and Payton Holden beat No. 31 seed Brenden Volk to the back draw with a 6-1, 6-0 win. The seeds in 16s don't begin play, in singles or doubles, until Sunday, with the first round completed today. At Saturday night's Opening Ceremonies and RxOptical/Greenleaf Trust and Hospitality Exhibition, 1994 Kalamazoo 16s champion and recently retired ATP professional Michael Russell defeated Marcus Willis of Great Britain 6-5(2) to start the evening. Willis, who made such a huge splash this year at Wimbledon by getting through a prequalifying tournament to reach qualifying and then advancing through qualifying to the main draw, where he won a match before losing to Roger Federer on Centre Court, said he has been recovering from a post-Wimbledon stomach injury, but is ready to get back on tour, hoping to get some wild cards here in the U.S. so he can sustain his momentum. Russell, who retired after 17 years on the tour, has now opened an academy in Houston, Michael Russell Tennis, and has been participating in exhibitions and events since his retirement. 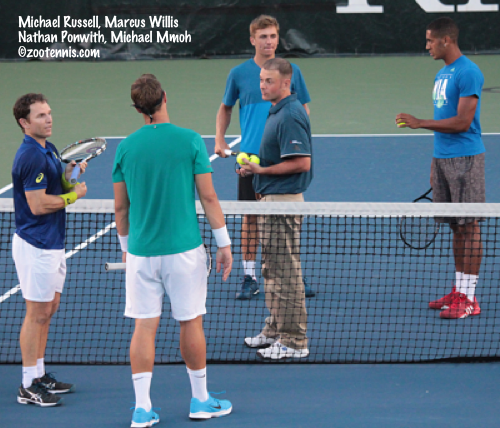 After Russell won the tiebreaker, top 18s doubles seeds Michael Mmoh and Nathan Ponwith took the court to play Russell and Willis in another one-set match. Mmoh and Ponwith, who lost Friday in the second round of doubles, took plenty of ribbing from Master of Ceremonies Michael Kosta, a former tennis coach and player who is now a standup comedian, but they laughed it off and turned a 4-2 deficit into a 6-5(2) victory. Both juniors stepped up their games late in the match, with good returning and some excellent work around the net, particularly by Mmoh. Frances Tiafoe, last year's Kalamazoo 18s champion, has reached his sixth career ATP Challenger final, with three of those this summer, at the $100,000 event in Granby, Canada. Tiafoe, seeded fourth, defeated qualifier Yasutaka Uchiyama of Japan 6-3, 7-6(3) and will play unseeded Marcelo Arevalo, the former Tulsa star from El Salvador, in the final. Arevalo beat Sekou Bangoura 6-1, 2-6, 6-1 in the other semifinal. Tiafoe is 0-5 in his previous Challenger finals. The ITF World Junior Tennis 14-and-under team competition came to a close today in the Czech Republic, with Ukraine taking the girls title and Argentina the boys title. Top seed Ukraine defeated No. 2 seed USA, 2-1, with Alexa Noel winning at No. 2 singles, but Whitney Osuigwe fell to Marta Kostyuk, the 2015 Eddie Herr and Junior Orange Bowl champion at No. 1 singles, and Noel and Osuigwe lost the deciding doubles to Kostyuk and Daria Lopatetska 3-6, 6-2, 10-6. The sixth-seeded US boys team, who lost in the semifinals to No. 3 seed China on Thursday, defeated No. 7 seed Korea 2-0 to finish in third place. Zane and Faris Khan picked up the singles wins for the US team. No. 5 Argentina defeated China 2-0, in two lopsided singles matches.